A steady stream of new customers is vital to your business, but don’t lose track of the customers you already have in the search for new ones. A loyal and satisfied base of repeat customers will ultimately be more valuable than even a large number of one-and-gone buyers. 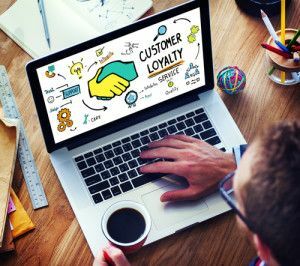 Here are some effective ways to build customer loyalty and ensure that your existing clients are happy with your company. Offer incentives and rewards to regular customers: Reward your most loyal customers with incentives such as discounts, two-for-one offers, frequent shopper cards or other valuable premiums. Let your customers know you appreciate their business and are happy to give them something extra in return. Always send a gift or nice card to any customer who refers their family and/or friends to you. Offer above-and-beyond customer service: Offer the best possible customer service to all of your customers, and you’ll quickly build a core group of loyal clients. Go out of your way to make sure your customers are satisfied. Send a customer satisfaction survey promptly after each transaction. Respond immediately to any problems or complaints and resolve the issue quickly and generously. Make sure your employees are well trained and thoroughly educated on your products, services and policies. Be willing to bend policies when necessary to ensure customer satisfaction. Address your customers by name and be genuinely happy to see them and serve them. Cross sell and upsell: Cross sell other products or services that are related to a customer’s current purchase, and upsell your products and services to provide more for less than the regular cost. Position cross selling and upselling as a benefit and convenience to the customer and your clients will appreciate being let in on better deals and complementary offers. What are you doing to build customer loyalty and ensure your existing customers will come back to you when they need similar services again?